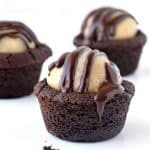 Amazing chocolate cookie cups filled to the brim with homemade chocolate chip cookie dough and drizzled with chocolate. The ultimate dessert for cookie lovers! If you’ve never made cookie cups before, you’re in for a quite a treat. These chocolate cookies are heavenly, with a crispy, chewy, choc crust. But take that and add a big piece of chocolate chip cookie dough and what do you have? The ultimate all-in-one cookie dough dessert. Making cookie cups is so much easier than you’d think. 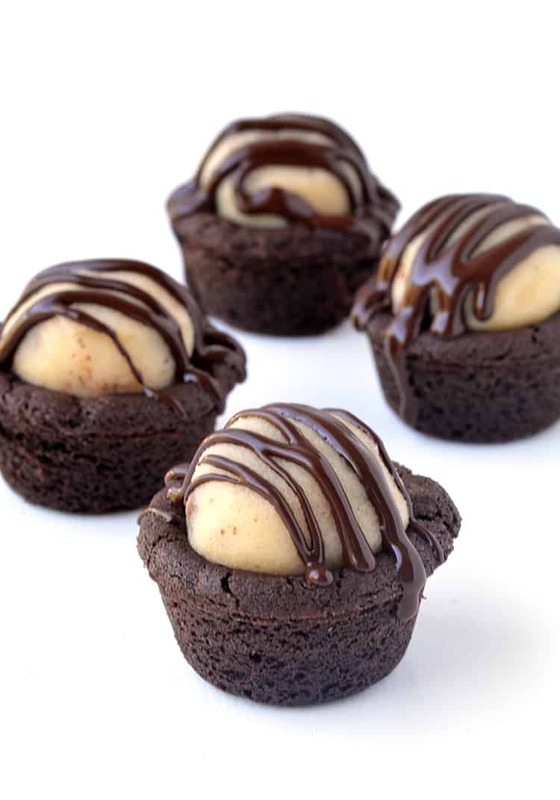 For these chocolate cookie cups, I tweaked the recipe from my favourite Chocolate Fudge Cookies. It’s the perfect cookie dough for making cookie cups. 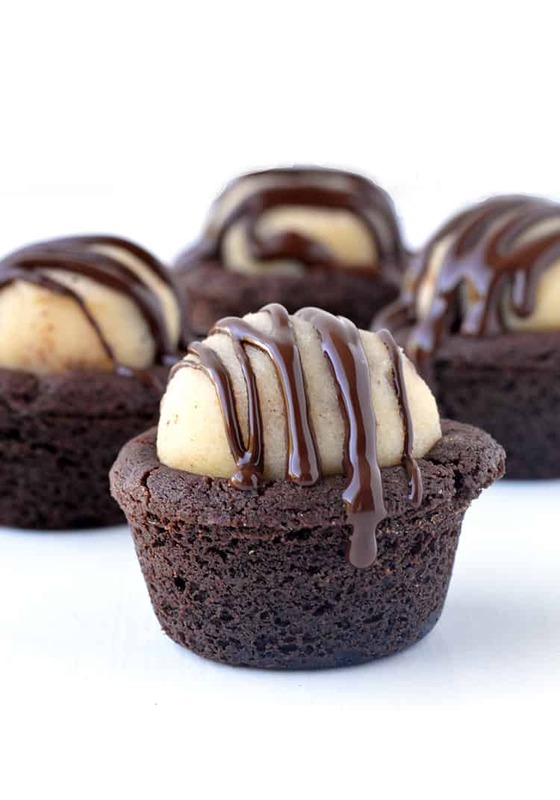 All you need to do is place small balls of chocolate cookie dough in a mini muffin pan and press down slightly to make the perfect cookie cup shape. My trick? Using the end of a rolling pin dusted in cocoa powder. 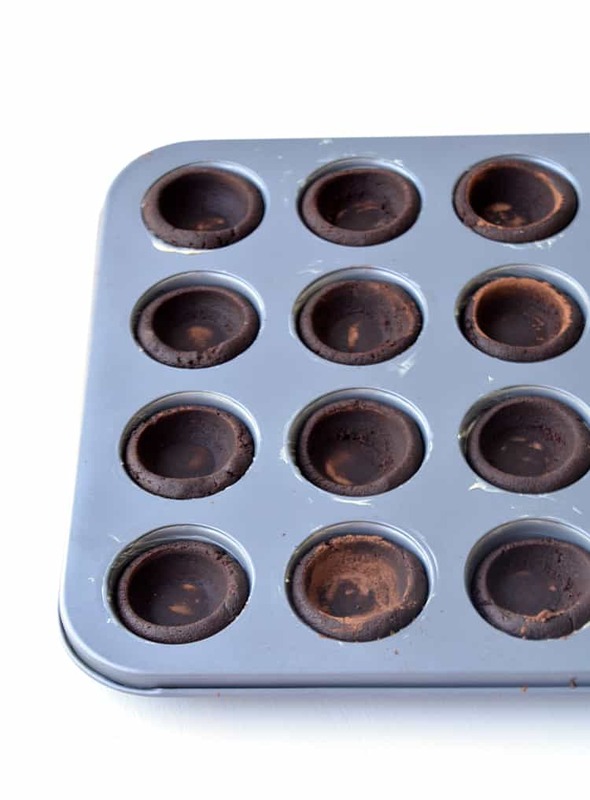 Once you bake these cookie cups they will puff up slightly – this is ok. You can simply reinforce the hole once you remove them from the oven. Then leave them to firm up slightly in the muffin pan before gently removing them. It might be tempting to try and remove them earlier but they will be quite fragile. So in the meantime, you can get started on making the delicious chocolate chip cookie dough. Just like my Funfetti Cookie Dough, this chocolate chip cookie dough is buttery and egg-free. And delicious. Like I-can’t-get-my-face-out-of-the-bowl kind of delicious. But try as much as you can not to eat the cookie dough because you’ll need it to make these Chocolate Cookie Dough Cookie Cups👇🏻 And you won’t regret it! 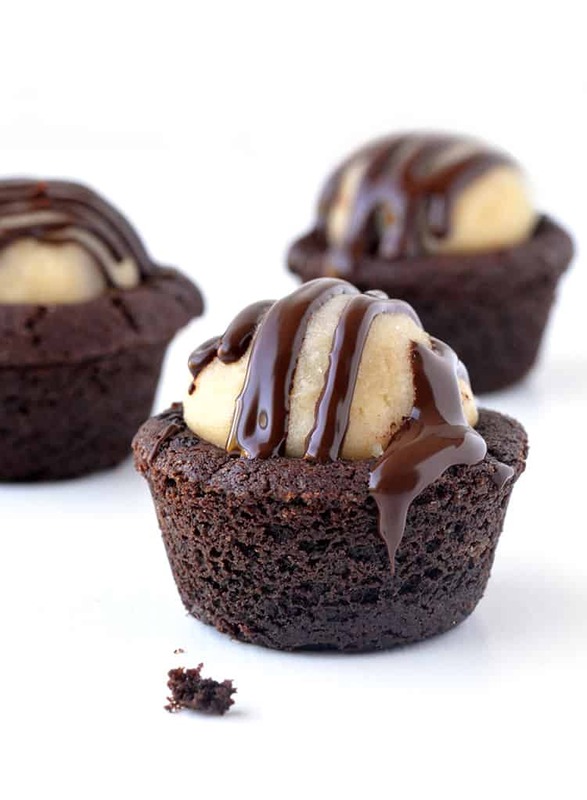 Once your cookie cups have cooled completely, it’s time to pop a ball of chocolate chip cookie dough inside. The final touch? 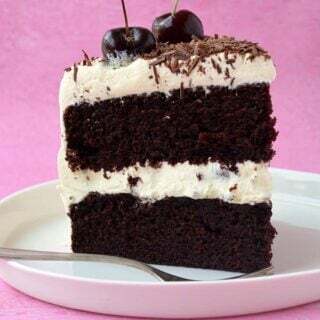 A drizzle of melted dark chocolate. This dessert is outrageous, in the best kind of way. 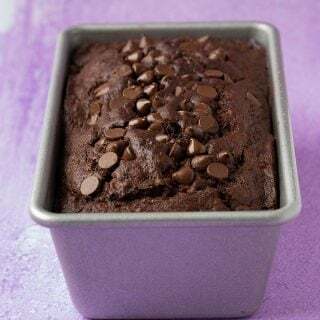 The cookie dough is buttery and creamy and absolutely loaded with milk chocolate chips. The chocolate cookie shell is crispy and cocoa-laden and the drizzle of chocolate just puts them over-the-top. 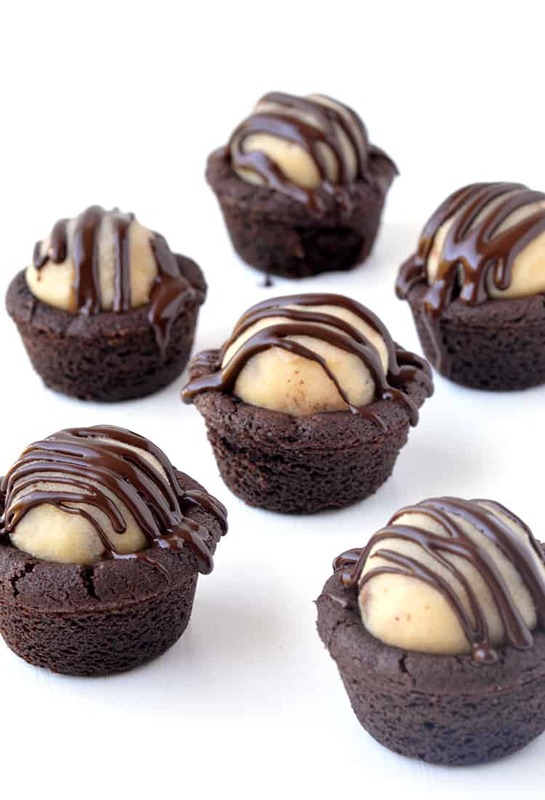 One of the great things about these Cookie Dough Chocolate Cups is it makes 20 cookies. TWENTY. Which means it’s the perfect party recipe because you can easily feed a crowd. Or a small group of very hungry people. They’re creamy, crunchy and filled to the brim with chocolate. 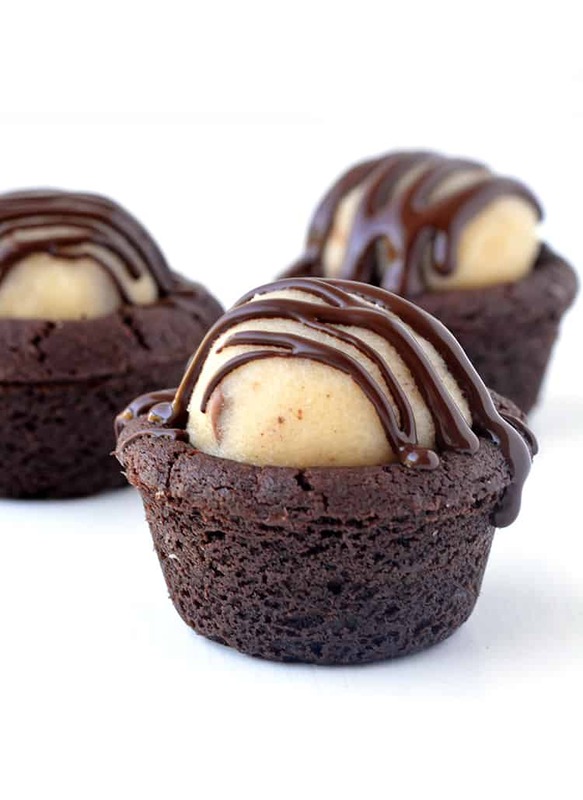 If you like cookie dough ice-cream, you will be all over these Cookie Dough Cookie Cups. As suggested in the recipe, chill your cookie dough for at least 30 minutes before baking. Make sure you grease your mini muffin pan really well to ensure the cookie cups don’t stick. Leave the cookies to cool for at least 15 minutes before gently removing them from the muffin pan using a small butter knife or spatula. 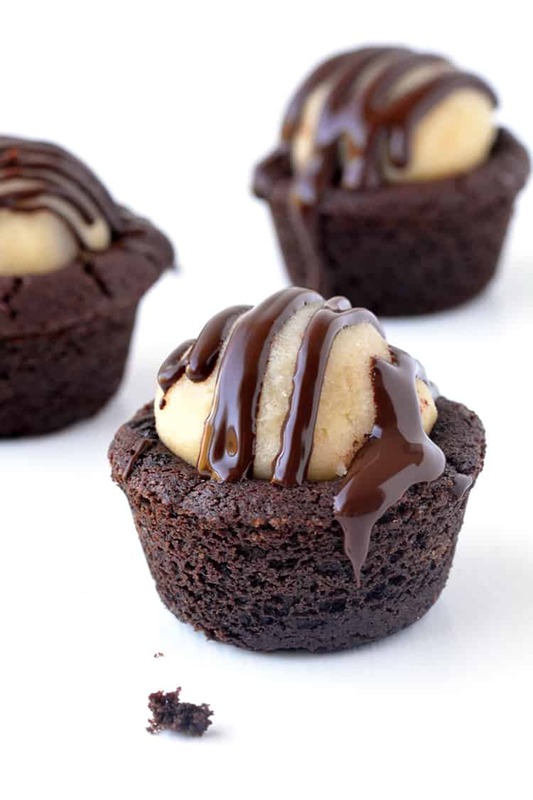 Buttery chocolate cookie cups stuffed with chocolate chip cookie dough. Grease mini muffin tin well with butter. In a large mixing bowl, add butter and sugars and beat with an electric mixer until combined. Add the vanilla and egg and beat until smooth. Sift in the flour, cocoa powder and baking soda and stir until the mixture comes together to form a soft dough. Cover with plastic wrap and chill the cookie dough for 1 hour. Preheat the oven to 180 C (360 F). Using your hands, roll the dough into small balls, and place each one into the mini muffin tin. Continue until you run out of dough – it should make 20 cookie cups. Gently press down so the dough fills the cavity and has a flat top. Then grab a rolling pin dusted with cocoa and press down and twist on top of the dough to create a hole or cavity in the middle of each cookie. Place the tray in the oven for approximately 10 minutes. Remove from the oven. At this point, the cookies will have puffed up quite a bit, so grab your rolling pin again and very gently reinforce the hole in the middle of each cookie. Set aside to cool for 15 minutes and then very gently remove the cookies from the tray and place them onto a cooling wire rack. It’s ok if the cookies appear really soft, especially in the middle, as they will firm up when they cool. To make the cookie dough, place butter, sugar and vanilla in a large mixing bowl and beat with an electric mixer until smooth and creamy. Add flour and milk and beat until smooth. Stir in chocolate chips. 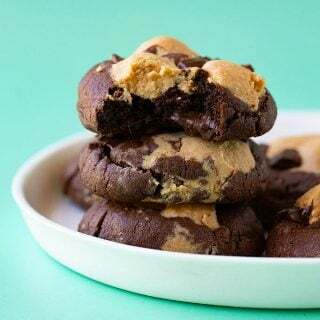 Cover and place the cookie dough in the fridge for at least 15 minutes, then once the cookie cups have cooled, Roll tablespoons of cookie dough into each cookie cup. Melt chocolate in the microwave, stirring every 20 seconds, until smooth. 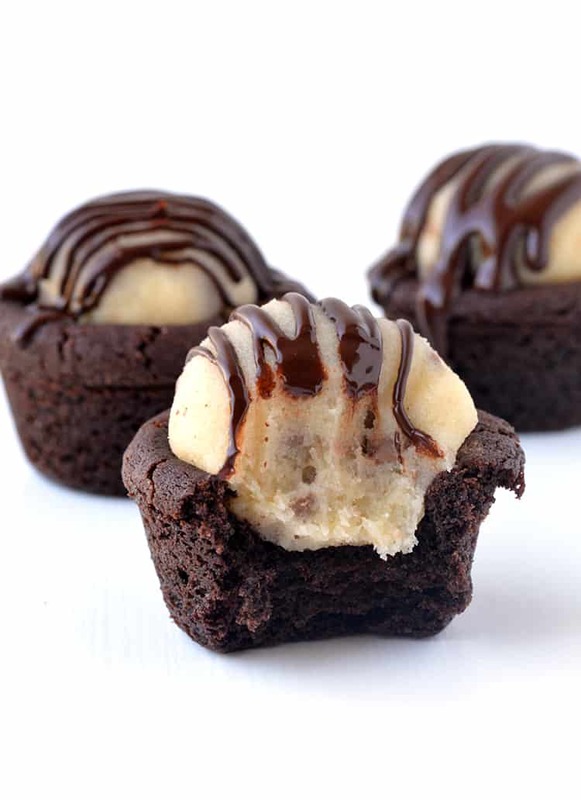 Drizzle chocolate over the top of the cookie cups. I would like to make these for a picnic. Do they have to stay refrigerated? Or will they be OK in the heat for 45 mins or so? Hi Angie, thanks for your comment. Unfortunately I can’t really comment as it really depends on a variety of factors, including the weather. But I do hope you enjoy them! Can you substitute regular sugar? Hi Dena, yes that’s fine! I want to ask u about this recipe.. U didn’t bake. Cookie filling after rest in the fridge.. Coz u used plain. Flour in the batter. Is it okay? Hi Natalie, the filling is cookie dough so it is not baked. If you are worried about eating the flour, you can toast it. It’s really up to you. YUM! 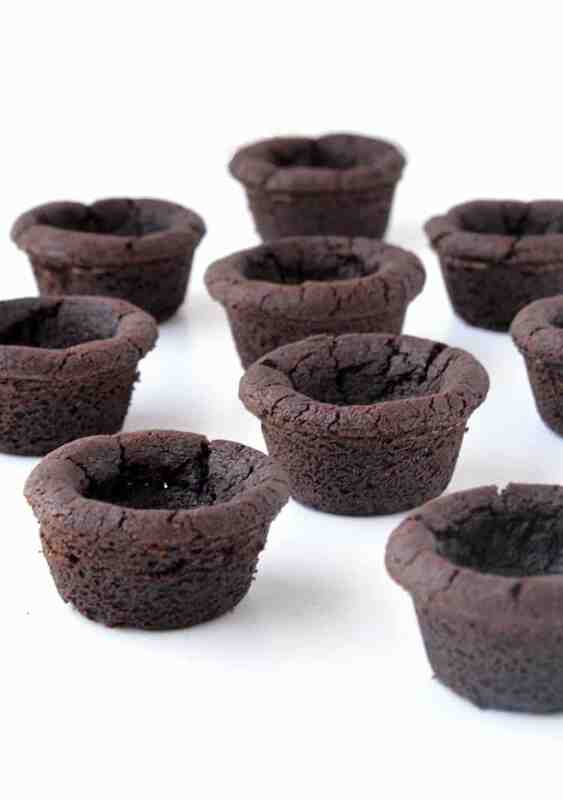 These cookie cups look so chocolatey and delicious! Perfect! I think so too Josh!